Usually, when we get an ID request it is of a bug from someone's backyard. Perhaps the same can be said of the critter below, but Dr. Colin Beale's backyard is the Southern Serengeti, in Tanzania. 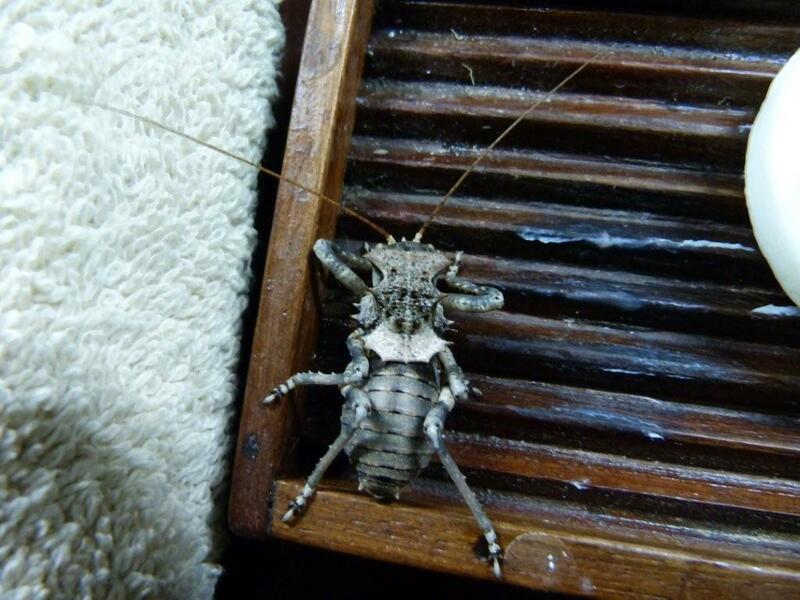 Can anyone help us identify this wee beastie? Dr. Beale thinks it might be a cricket nymph. To help with the ID, it might be useful to know that he caught it trying to eat his brains (or else it was just resting on a soap dish with 1 cm ridges so you can know the scale, I can't remember). If you would like to follow more of Dr. Beale's adventures in Tanzania (and I think you should), then go to Safari Ecology. It's full of pictures, mostly of creatures that are readily identifiable (and probably never to be found here). Thanks, Colin! 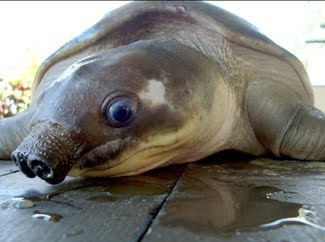 That's the pig-nosed turtle, Carettochelys insculpta. I learned about it from an article at Australian Geographic which told me all kinds of interesting facts about this species: It's the only surviving member of the family carettochelyidae, it's an evolutionary transition between land and water turtles, and it's very tasty and could go extinct if hunting isn't curtailed. But they couldn't tell me what I really wanted to know: If I posted this, would a whole bunch of you comment "That's not ugly, that's cute!"? It's because of creatures below that I don't frequent hydrothermal vents in the abyssal depths of the ocean. I've read Dune, and I've seen Tremors, and such encounters rarely play out nicely. True, this photo was taken with an electron microscope. True, this creature is almost as small as a bacterium, but the point remains. Although, it's never fair to look at a creature too closely. If you put a magnifying glass on my face, oh the porous horrors you'd see (a la Gulliver's time in Brobdingnag). Thank you for the hydrothermal worm, Ellen. 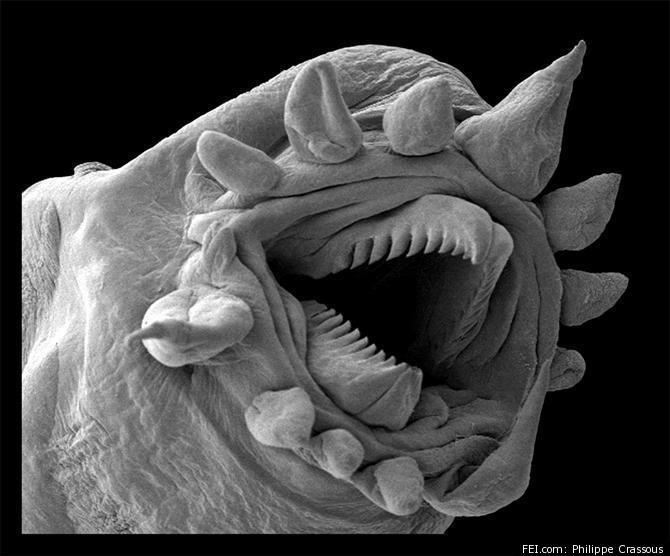 Our microscopic world just got a bit horrificer. Joan brings this one to us. Behold the Damascene goat. This goat, which looks like a sock puppet, has been featured here before. 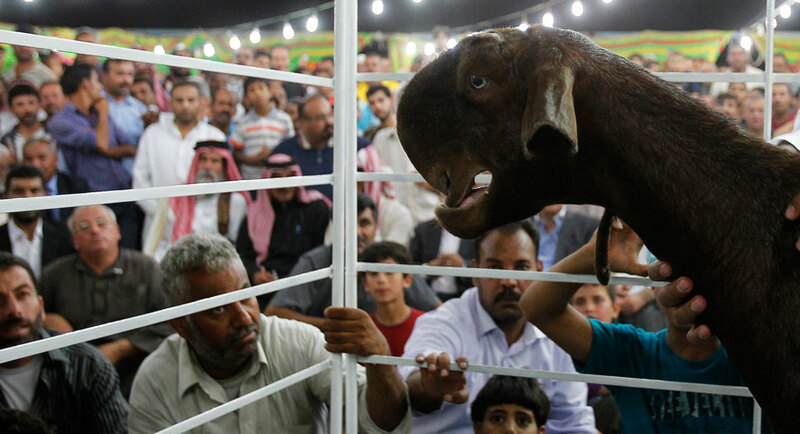 Every year a contest is held in Amman, Jordan, to determine just which of the lucky females will win the title in her category. Here is this year's winner. And we can all see why. If those tube ears weren't enough, then that snout would be. Wasieef is her name, and she'd better get some rest. She'll be making tours of the country, speaking as a guest lecturer at schools, visiting orphanages, making policy statements, etc. Just wait till Donald Trump gets his hands on her. That's a crested rat, or maned rat, or Lophiomys imhausi to be precise. 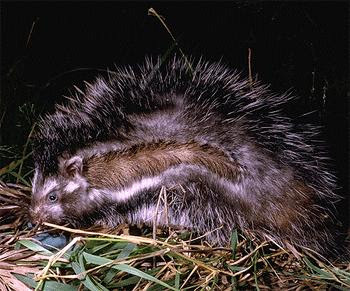 The species is in the news lately because of some research showing that, in the words of one eminent science blogger, this animal "slobbers poison on its fur, dares predators to bite it." Yeah, this seems like the kind of behavior that belongs on my other blog. But my first thought was "Whoa, that is a terrible photo! What is wrong with that animal's fur?" Surely the poor thing was unfairly caught on a bad hair day, right? I always think that a taxidermied specimen in good condition like that one is, I'm afraid, pretty damning evidence. 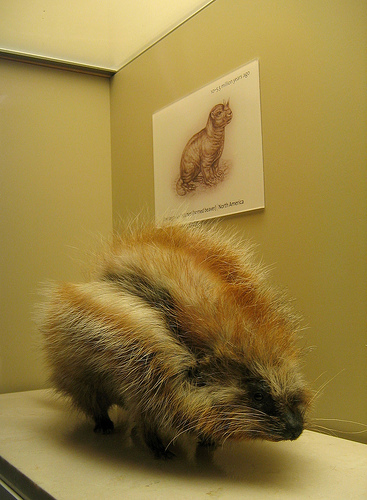 If the Smithsonian Institution labored over that animal with all its experience and skill and that's what it came up with, I am sorry, crested rat, but you are one unattractive rodent. Photos from wikipedia and Flickr user isolethetv.